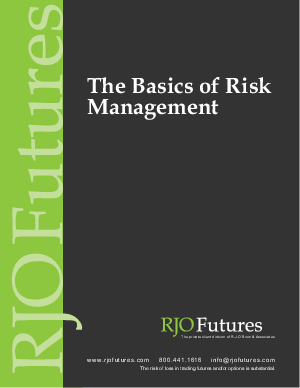 This informative guide will lead you through some of the more fundamental steps of managing risk within your trading plan. RJO Futures is Your Futures Trading Partner. We offer quality brokerage services through a solid reputation, value-added resources, and customer-oriented relationships. One of the friendly and knowledgeable RJO Futures brokers will contact you to discuss how you can apply these strategies to your trading plan! Risk Disclosure: The risk of loss in trading commodity futures and options is substantial. Before trading, you should carefully consider your financial position to determine if futures trading is appropriate. When trading futures and/or options, it is possible to lose more than the full value of your account. All funds committed should be risk capital. Past performance is not necessarily indicative of future results. Complete the form to request more information!